Courses - Infinity Human Resource Group Inc.
Online learning involves the delivery of educational content, through computer-based means. In its most simple form, it can consist of a basic PowerPoint® presentation, a QuickTime® movie, a Portable Document Format (PDF) file or other media. The online programs developed by the infinity are modular in configuration, with individual modules requiring approximately 20 to 30 minutes to complete. This equates to roughly 80 to 120 minutes of actual in class training time. Flexibility is another hallmark of a properly integrated e-learning service. No longer is the learner or organization tied to the classroom or to a classroom schedule. Training can occur at any time and at any location with Internet access, which can include our client's offices or the home's of its employees. With the addition of professionally produced video and digital photographs, taken on site using our client's personnel and the scenarios they are facing, Infinity will continues to set itself apart from other training providers who can only deliver off the shelf programs. Delivering excellent training, which is specifically designed and branded to our clients is Infinity's reason for being. With customization of program content comes an increased level of learner buy-in and information assimilation, not found on standard off-the-shelf programs. In addition to the delivery of programs, e-learning, through appropriately configured Learning Management System, (LMS) allows for tracking and auditing of all training programs within the organization. With the appropriate level of access, the administrator can quickly generate training reports, for individuals, groups within the organization, or the entire organization, in just a few clicks the mouse. Infinity provides the infrastructure and configuration know how to move our clients to the electronic age. Once the system is set up and configured, Infinity's LMS can be utilized for training in any area of the organization. Utilizing infinity subject matter experts or our clients learning material online modules can be quickly developed and delivered. Should our clients only require quick conversion and hosting, PowerPoint® files can quickly be converted using Infinity's cost effective conversion services. This allows internal training to be developed and delivered in hours or days instead of weeks or months. Contact Infinity today for temporary access to our LMS and a demonstration of our online learning capabilities and see how Infinity can help take your organization to the next level in the development of your training program. 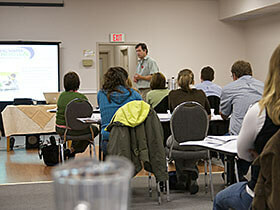 This course looks at implicit as well as explicit bias and the effect they have on the decision making process. Touching on developing cultural competencies as well as reviewing various pieces of legislation helps students to become more aware of their responsibilities and how to decrease incidents of biased behaviour. Contact sales@infinitygroup.ca for further information. 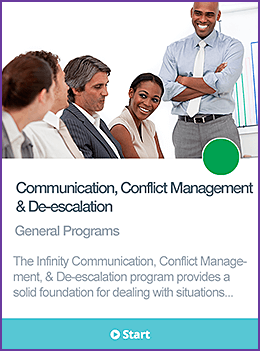 This course looks communication, conflict management, and de-escalation for individuals dealing with potentially violent situations. It provides processes and techniques that will decrease the likelihood of a confrontation becoming physical. 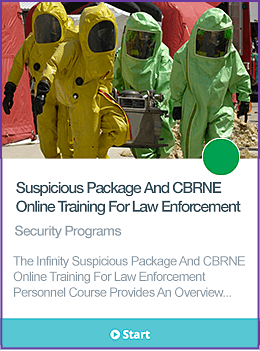 This course looks at situations involving suspicious packages those involving Chemical, Biological, Radiological, Nuclear, and Explosive (CBRNE). It is geared to law enforcement personnel dealing with these types of events. 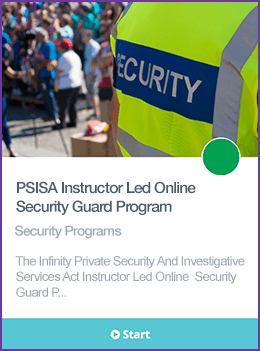 This course is the Infinity version of the Ministry required security guard training program. It includes all of the required material for an individual looking to obtain their security guard licence, except for emergency first aid. 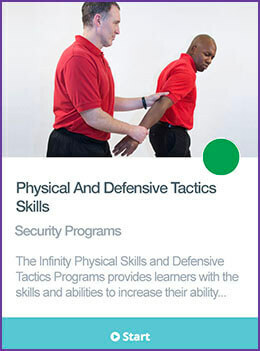 This course provides the learner with simple effective defensive skills that can be used to disengage from or gain control of a violent situation.